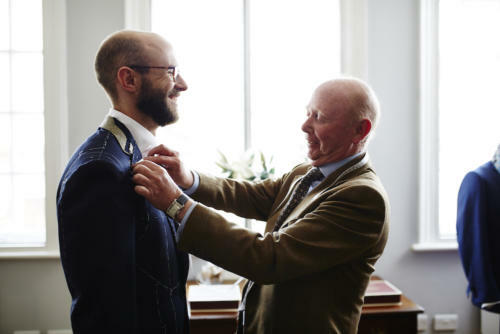 I recently had the basted fitting for my two suits from Whitcomb & Shaftesbury – the tailor that runs a workshop in India but has all the suits cut by the same person London. They had offered to make me two suits – one put together in Chennai and one in Savile Row – in order to be able to compare them. There is a big price difference: £1360 for the former and £3040 for the latter (ex-VAT). Of course, as soon as you know there are differences, you seek them out. You notice that the waistband of the trousers on the Indian suit is just canvas at the baste, where the London one has cloth over the top. It makes no difference at all to the final suit, but you focus on the differences rather than the similarities. And there were a lot of similarities – pretty much everything was the same. The same hand-padding of the chest, the same canvas and horsehair, the same hand-sewn buttonholes. This is no coincidence, as Whitcomb & Shaftesbury’s coatmaker – Bob Bigg – has been going back and forth to India for years, slowly training the local women to sew in the same way he does. Bob, who has been a coatmaker on and around Savile Row for decades, wasn’t sure he’d like India to start with, but has slowly taken to it. A lot of Bob’s stories echoed things tailors have been telling me for years – in the UK, Italy or anywhere. How the hand holding the cloth is more important than the one sewing, as it sets up the cloth and maintains the tension. How it’s always surprising how many ways there are to do the same thing, and usually one is no better than the other, just easier. It’s the same challenges, whether you’re training an ex-fisherman in Chennai or a graduate in London. It’s still early days for the two suit, but signs are good that the Indian suit in particular (Whitcomb & Shaftesbury called it Classic Bespoke) will be a great value option for anyone looking to try bespoke for the first time. You can follow the discussion on Whitcomb & Shaftesbury – first fitting by entering your email address in the box below. You will then receive an email every time a new comment is added. These will also contain a link to a page where you can stop the alerts, and remove all of your related data from the site. Hard to tell from the photos, but are they of the same suit, and if so which is it? Sorry, I meant which is the MTM and which the bespoke. Or is that part of the story? I suppose I was relating this to your 2011 post about Tom’s English Cut foray into India, where MTM was the term used to describe what was being made up. The flannel looks lovely. Do recall the weight and in which book you found it? I think this is a very intriguing concept, particularly since it very competitively challenges high end MTM price wise and, in theory, offers a far superior product. I will be intrigued to see if any other firms follow suit. A lot of men I know who aren’t enthusiasts still really love the idea of bespoke tailoring, but they simply cannot afford the £3000+ required. If something like this can make that level of quality more accessible, then I’m all for it. I do wonder though how the margins in this sort of business model compare to those in MTM, though – I’m guessing they aren’t quite as good. Simon, have you heard anything about the quality of Apsley on Pall Mall? 1. How many fittings can one expect to receive? 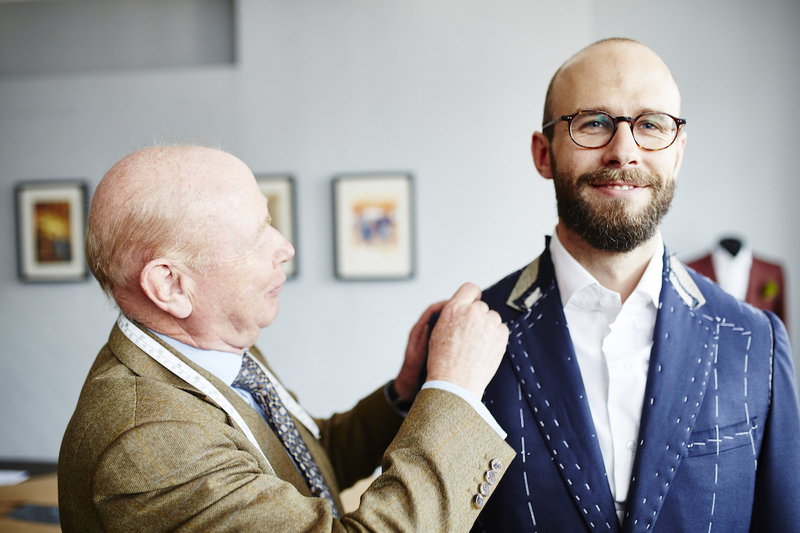 2. Who takes responsibility for taking measurements and conducting the fittings – the cutter or a salesperson? Simon, what about fabric choices? Will they do CMT? I have to say the fit looks really nice and trim. On the suit in the first pic I’d want the sleeves a little narrower, but it’s just a first fitting. If it turns out well I’d be sold on the Indian option. Intrigued by the blue flannel, interested to know what use you might put it (would you use it for work for example?) when finished I would love to see the cloth/colour palette that you might match it with. 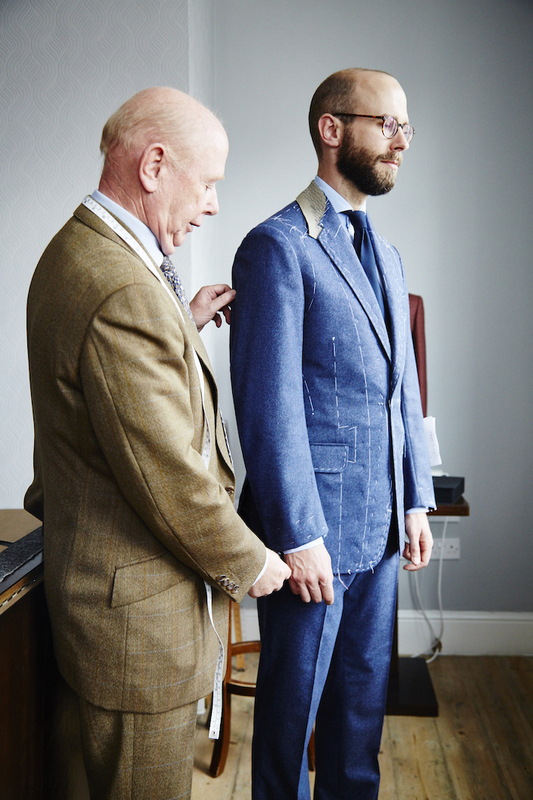 One small point – I’d debate your definition of bespoke; just as some argue MTM is the same thing (Sartoriani case…), the tradition of bespoke implicitly suggests an in-house or nearby construction (why? due to the historic need for alterations following fittings). To construct in another country (many MTM do, King and Allen for example) detracts from the ‘local craft’ requirement that underlies the historic bespoke model. If the unique pattern is the only requirement (sans high craft levels, local construction, localised tailoring flourishes – think Neopolitan shoulder) then, it seems, a new definition of bespoke is being promoted. Thanks, yes for work but with likely a plain blue shirt and navy tie. Are you paying full price for both suits? Be very curious to see how the classic bespoke turns out simon as it seems a comparable price to cad and the dandy there on the row so its a firm rival. Are you planning on trying their bespoke shirt service also, so you have sampled their full offering? £1360 plus VAT is £1632. Is that a good deal for a suit made in India? Clive Phythian at Sims & MacDonald will make you a great bespoke suit in London for £1500. I am from Hong Kong and have recently been reading your blog and been doing researching on bespoke tailoring as I honestly don’t know much about it. I did notice that you used to have your suits made locally by Edward Tam. I am intrigued by this fascinating industry and would like to get an apprenticeship in one of those great tailoring houses on Savile Row and learn to make great suits in English way eventually. I am also interested in making my first ever bespoke suits and hopefully this experience would help me understand more as a customer before I get into this business in near future. I work in service industry and I find it very helpful if one can experience first hand what the customers feel like in their shoes, so to speak, before one provides them the service. 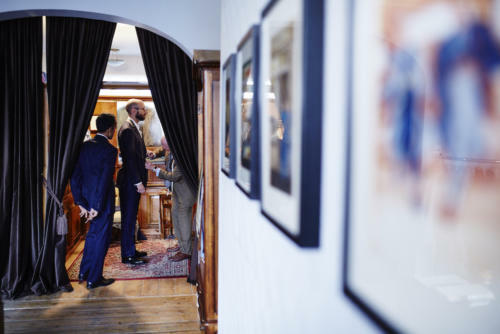 Regarding this post, my impression through my recent understanding is that the Cutter in house is probably the most important in the tailoring process as he could make sure you have the right fit and cut. So I am very intrigued by this “Cut in London, Sewn in India” offering, especially due to the highly competitive price. If indeed, the cut and fitting are most important and in this case, its all done by the head cutter in London and at the same time they could make sure the workers in Chennai have exact same level of skills and standard, then I honestly don’t see why one should pay a lot more to have the same suit made in London. Well, of course other than the reason of keeping the tradition. I would like to know with the same price tag (Made in India one), would you recommend me to invest in a bespoke suit with Whitcomb in London, or Edward Tam (Or other equally popular local tailors) in Hong Kong whom you highly recommended couple of years ago? In terms of skills and experiences, do you reckon Whitcomb is better than those tailoring houses in Hong Kong? I did notice that some more famous tailors here charge more or less the same as above. Convenience is not my concern. Just wanna understand the differences in quality, as ultimately I consider it as an investment so I would like to have as high quality as possible for sure. Thanks a lot for advice. Thank you Simon. I have the same doubt about the Hong Kong tailors in terms of skills and quality. It’s world famous for its speed only most probably…oh and price of course. But then if I saw them charging anything above GBP1500, why wouldn’t I go for W&S instead? That was just what I was wondering. For my first time bespoke suit, and I hope it could last a little longer than just a few years with the right amount of TLC, what material and style would you recommend I go for? That is I am hoping the end product would be more timeless….or “permanent” rather. Oh just a follow up question…. I have come across English Cut by Thomas Mahon who has an office in London but his workshop in Cumbria. He also offers a comparatively lower price range for a bespoke suit, it was explained that it was due to the fact that the suits are not made in London, which inevitably has a high labour and rental cost to cover. In that spirit, I would agree that it is still bespoke even though it is not made on Savile Row. Have you ever tried his service? By the way, he launched a MTM service a year or so ago and it seems very popular but as far as I know, the suits are made in Japan, not in UK. What do you think of that? It seems to be a similar story with Whitcomb, Thomas Mahon is very involved in the tailoring process but the actually making of the suits are done elsewhere. Would love to hear from you. Thanks. A very necessary venture and comparison . How much of the price of each suit is the contribution towards leasing offices / workshops on Savile Row? Can we get a Savile Row standard suit without payin towards the extortionate lease costs. Let’s not shy away from cost . Also I think it would be good to have a comparison grid of what you get with each and what you consider is worth getting and what can be compromised. Can we get a Savile Row standard suit without paying towards the extortionate lease costs? Oh well, don’t we all want a beautifully hand made bespoke suits at cost price? Coming from Hong Kong, I understand very clearly that everything we buy here, we are contributing in paying off the REALLY extortionate rental costs here. Most international Fashion houses that have business here mark up at least 30% in retail price compared to the same products sold in Europe….Not because we have a better working condition nor have higher salary, hence, higher labour cost, mostly or simply just because of the rent! Thanks for the response Simon and the argument re. the importance of the cutter. I still question the validity of this though – are we saying that, price aside, the hand work is equivalent to that delivered on The Row or to that provided by, say, Graham Browne’s outworkers? Given the broad interest in this subject do you think that this offering is ultimately superior to the London £1000+ tailors such as Graham Browne, Sims & MacDonald, Chris Kerr etc.? I like the RAF blue flannel – can you spill the beans on the cloth details? The fact that bespoke is not scalable de facto means that costs can only be reduced by economies in property associated and labour costs. Persuing this route to the exclusion of everything else will result in the closure of the Row and the skills associated with the craft leaving these shores. Personally I would hate to see this happen and it’s one of the reasons that I love A&S and think that their apprentership scheme is simply marvellous. Simon, you have been good enough to field quite a few questions on this subject. It seems (correct me if I am wrong), that at the heart of the operation is the cutter and John McCabe is obviously a good one; I’m particularly interested in his time at Dege. Would it be possible to learn more (perhaps an interview?) of the cutters point of view re. construction, the changing impact of fashion on cutting stylish garments, is the quality of cloth as good as was historically (I would hope so), have the skills on The Row remained as high as they were etc. The interest stems from the impact of individuals (vs. prevailing fashions) such as Frederick Scholte and Tommy Nutter and the continuing influence of their innovation upon UK tailoring. Still reading upon your posts and trying to make a decision on my first fully bespoke suit. I think ive narrowed the places down to three. With this said, which would you recommend? Im in my late twenties and would like to wear the suit for a couple years + wedding in sept, but still stay fashionable. Thanks a lot for this article and for introducing us to WnS. I recently had one two piece made from them and am very pleased with both the actual fit and the experience. Thanks again! Simon, coming to your website a bit later than a lot of people I think. I came across your review of W&S a couple of weeks ago and my husband was intrigued enough to visit. We happened to arrive just as Suresh was going through the door with his lunch He walked us up the stairs, introduced us to John and Sian and held a consultation. Kevin has picked a fabric and design but will need to wait until that extra stone comes off (he is fed up of having his G&H suits altered) so is aiming for Summer. He currently owns 2 G&H RTWs, 2 G&H M2M and a couple of M2M from a local Gentleman’s outfitters in Nottingham (Smalley & Sons). He also recently purchased a M2M tuxedo from G&H for stage wear. Now wanting to take the step up to bespoke so S&W seem a solid choice. He owns shoes from Crockett and Jones, Sanders, Loakes, Trickers and Barkers. Barkers are currently his go to as we have a friend who lives in Earls Barton and buys from the outlet there. What is your opinion of these ‘seconds’ shoes – they can be a quarter of the RSP and he can never find any issues with them? Also any recommendations for women’s clothing please? Nice, sounds like you’re in good hands Tracey. Often such ‘seconds’ are just ends of lines that didn’t sell, so they’re absolutely fine. Do check if there are any imperfections though – which again, you might be perfectly fine with, but good to know they’re there. Nothing on womenswear, sorry… I wish there was one I could recommend!